Ohohohoho! Did any of you laugh wildly when you read that and thought….”NOW YOU’VE DONE IT!”?? No? I didn’t, I was too busy being chipper and happy and all as I moved toward perfection. I could even hear little birdies chirruping sweetly as they flew excitedly around my head. Ugh. Yeah, I know, it’s a marked up version I made using “Paint” because I forgot to send myself the chart this morning…Gosh, I wonder WHY?? Next time I say anything positive about how Caleb sleeps, please…please…just remind me I’ll need an extra cup or two the next morning to wash the taste of crow out of my mouth. All is still not exactly perfect. Eric and I had an interesting IEP meeting yesterday. We are still having meetings every 4-6 (mostly 6) weeks, per his IEP, even though I’m not sure we need it now. Things have been going so smoothly with his team. We love his teacher, the aid, the specialists and the school. LOVE them! The communication we have with his teacher is terrific. If something is going on that we should know about, we hear about it immediately. Plus we get tons of cute stories. 2. They are seeing how much better he performs when he’s in a group with peers rather than 1:1 with staff…one example…the PT struggles to get him to demonstrate skills for evaluations even though he uses many of the skills in Gym class as part of games. 3. He is more motivated by real world activities than table top activities. Example, he will unsnap his own coat with much less whining that he will unsnap the snaps on the manipulative his OT has been using. Notice I said “less,” he’s still not a huge fan of those fine motor activities. 4. He *loves* his Assistive Tech specialist now that they have switched to an iPad rather than that VantageLite he hated so desperately. And he’s using it with much less resistance. Most of this is pretty standard FX behavior and so we were able to share some ideas that we’ve picked up from other FX parents. The BEST part of the whole meeting is that since he is demonstrating how well he does with typical peers, they’re going to start integrating typical peers in some of his pull outs. Anytime I hear this it gives me warm fuzzies…I do so love any effort to involve his school community and peers more! It really makes the first 5 years of struggling to maintain integration totally worth it. He’s struggling emotionally. We are investigating the why but for the last month or more he’s been crying at school more and more often. And the bouts of crying are lasting longer. It just breaks my heart to hear that, especially since they’re trying so hard to find out ways to break him out of those episodes but the old ways just aren’t working. He’s not responsive to his peers during these times and his teacher and class aid also can’t bring him out of the funks. My poor baby. We have theories…lack of sleep (he’s been having nighttime wake ups again) or anxiety (I hate this part of FX!) top my list but they are doing an FBA to see if they can pick out a pattern. The sleep thing is really just a theory. We have no idea how often he is waking up since he’s now staying in his room to avoid setting off the motion sensor which wakes up Money (and sometimes Daddy) which results in an immediate return trip to his bed. Smarty pants. In the car on the way to work I mentioned maybe we should do a sleep study but…yeah…I’m not ready to sign up for that torture! 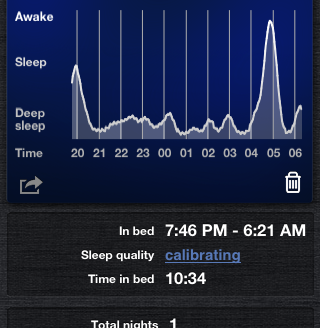 I recalled that a neighbor had used an app once to track his sleep on business trips. After a little investigation, Eric found one that will work on C’s iPad. We hid it under his sheets last night (it works by sensing movement). We will be getting graphs like this from it every night. After a few days of collecting data it will be calibrated to him and his movements and we’ll be good to go for collection purposes. This one doesn’t look too bad, it looks like he fell asleep pretty quickly and slept until just before 5 this morning. He did not go back to bed then, he got up and it kept running until we shut it off. As for the anxiety…we’re probably going to go back on the Celexa. I’m a little disappointed, I’d hoped that the study drug would be enough but it’s not at this point. I know all the researchers keep reminding us that the best treatment will likely end up being a cocktail but my ever optimistic heart really just wants the magic pill still. Damn it. I feel OK overall about where we are at. Caleb’s language in particular has made huge gains over the course of the year which is so exciting. He’s doing really well on his speech goals, even the one his ST looked back on and thought she maybe shouldn’t have included because it was pretty ambitious, lol. And even though we do have this pretty significant issue of his emotional state, we have some good ideas to try. We have his 3 year re-evaluation next month so we will touch base with the team one more time before the year is out to see what we can figure out. So, nope, my life still isn’t perfect *sigh* but we’re still reaching for it!